Now… I took a wild guess and thought you’d rather NOT dig around in the massive pile of 2,500 + Shopify apps on your own. So I did the leg work for you. And no, I was not paid to post these — they are my true, unbiased picks. Alright, alright, I did include our Flowify app (it’s just too good). But the others are completely unbiased… pinky promise. There’s so much to know about online marketing, it’s overwhelming. And while knowledge is great, it’s the implementation that counts. These hand-picked apps will help you in your quest to apply what you’ve learned about Shopify marketing. 1 – Yotpo Reviews, Photos, Q&A — Make “social proof” part of your secret sauce. Excite and educate your Shopify store visitors while increasing conversions with Yotpo. Yotpo allows you to harness your brand’s hard-won social media following to drive sales to your Shopify ecommerce store in creative and effective ways. Saucy, indeed! 2 – Klaviyo: Marketing Automation — Email marketing is alive and well, but do it wrong and you’ll have people unsubscribing in droves. Klaviyo makes ecommerce communication totally foolproof, with tools to segment your audience so you can send unique offers to different groups. I also like how it offers ways to recapture lost sales, and make better strategic decisions. But there’s much more inside – have a look and see. 3 – Back In Stock — This Shopify app allows you to automatically send your customer a notification when the product they’ve been eyeing comes back in stock. It integrates with multiple email providers and allows you to create a custom, white-glove experience. Smart! 4 – Bulk Discounts — Welcome to promo codes, coupons, and discounts… reimagined! Because let’s face it, Shopify makes it hard to avoid getting tangled up in the wires (tricky tech!). With the Bulk Discounts app, you’ll become a wiz with Shopify promo code creation and customizations. Some of the most important underpinnings of your ecommerce store are also some of the most mundane. But don’t underestimate their importance and don’t skimp — the success of your store depends on it. These Shopify apps will keep you professional, help to grow your customer base, and just make life a WHOLE lot easier. 5 – Flowify — Even though this app is our own, I’m not shy to put it on the practicality list. Look, if you’re really serious about running a successful e-commerce store on Shopify, you’ll need the right tools to get your financials and inventory up-to-par. With the Flowify app, its super easy to connect and automate your shop’s accounting with the tried-and-true Quickbooks platform integration. Shopify and Quickbooks make a dynamic duo. Don’t miss out. 6 – Avalera — When you’re setting up your first products in Shopify, the requirement to input sales tax is daunting. Where do you even start? Well, the Avalera app helps you get this right the first time around, eliminating potentially costly mistakes by calculating and updating your sales tax for you. Avalera takes care of taxes too. Their autofile feature is available for stores on Shopify Plus. 7 – ShipStation – Ship happens. And fulfillment can get messy if you have additional e-commerce sites beyond Shopify. So you can think of this app as a personal courier helping you keep it all straight. ShipStation has too many great features to mention here, but one of our personal favorites is the ability to give customers shipping discounts. 8 – Zendesk Support — Customer service is make-or-break! The Zendesk app allows you to view a customer’s data side-by-side with their support inquiry. We like the customer support chat feature — so 21st century! Honestly, is there any other way? 9 – OrderlyPrint — As the name suggests, this app streamlines invoices, receipts, packing slips, and return forms. We especially like the picking list feature, and how the app allows Shopify store owners to fulfill orders in bulk. 10 – Low Stock Alert — Never get caught again without a gizmo or gadget. Now you can avoid the costly and all-too-common mistake of running out of your most popular products. Pre-scheduled notifications alert you to low stock items, so you can ensure you get your re-order in with this Shopify inventory management app. So, there they are in all their glory. 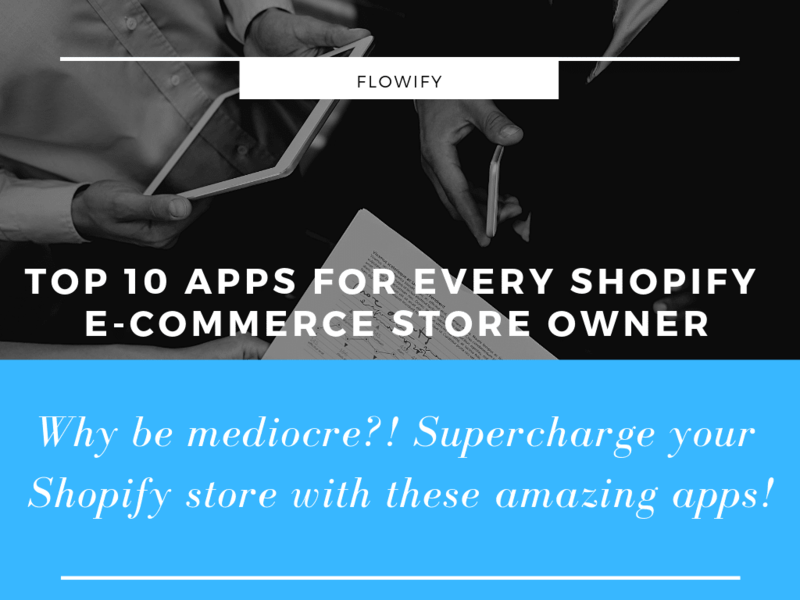 If you could only use 10 apps on your Shopify store, these here are a good bet. How about you… what app do YOU think belongs on the top 10? Tried any lately that you’d recommend? Leave us a comment below! And remember, Flowify has you covered when it comes to Shopify store accounting. The Flowify app integrates Quickbooks and Shopify with ease and elegance to completely automate sales tracking, inventory, refunds, processing fees, bank deposits, and more. Not to mention you’ll have organized and up-to-date business financials. Get started with Flowify today and see how a support team of accountants and bookkeepers can help you to better manage your Shopify store accounting.